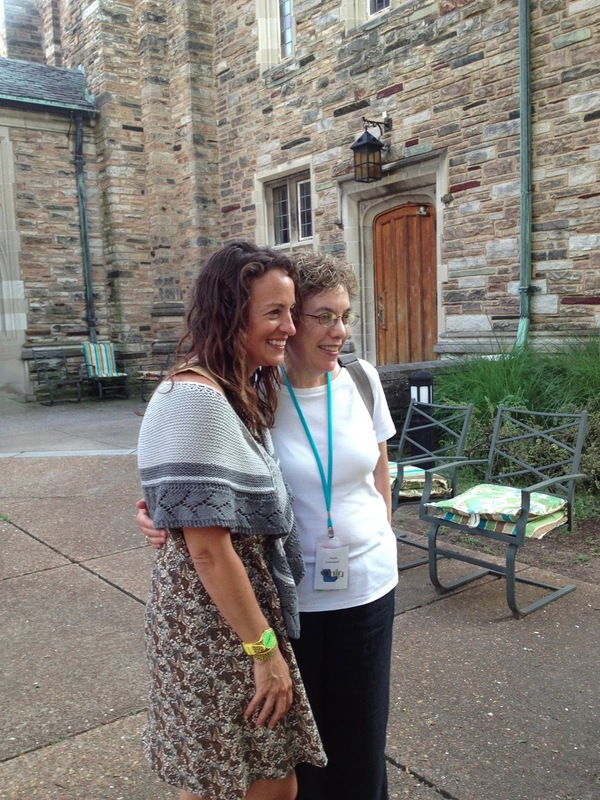 Last Wednesday I arrived in Nashville, Tennessee for the Super Summer Knitogether or SSK retreat. 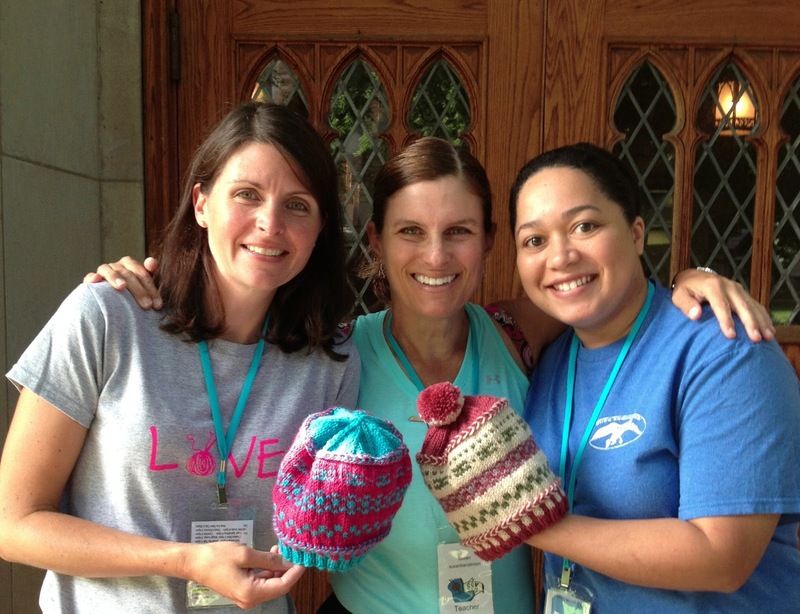 SSK is a 5-day knitting retreat in its second year hosted by The Knitgirllls, Laura and Leslie. 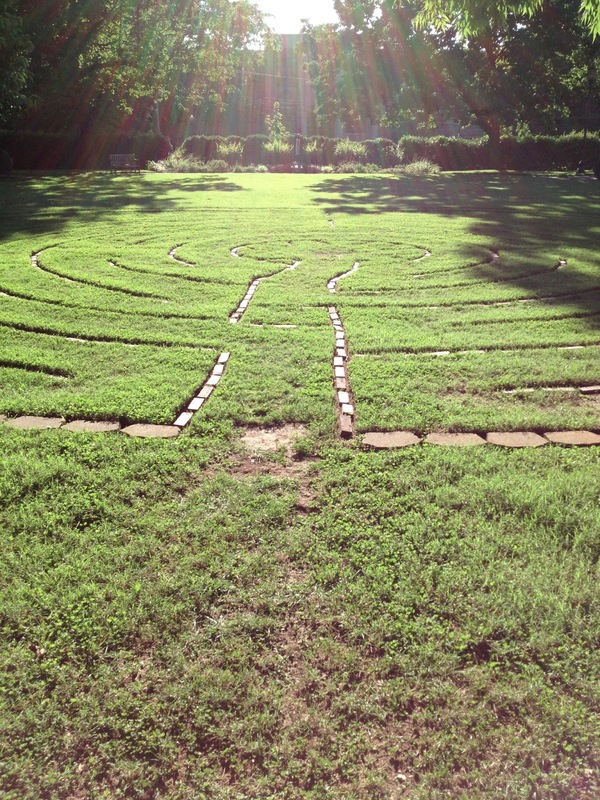 I remember following along last summer as the event took place and thinking what a wonderful retreat it seemed to be. A couple of days after SSK 2012 was over I received an email from Leslie asking if I would be able to teach at SSK 2013. I couldn't respond fast enough with a resounding yes! I had heard a little about the venue for the retreat, the Scarritt-Bennett center, a set of historical buildings located next to Vanderbilt University. 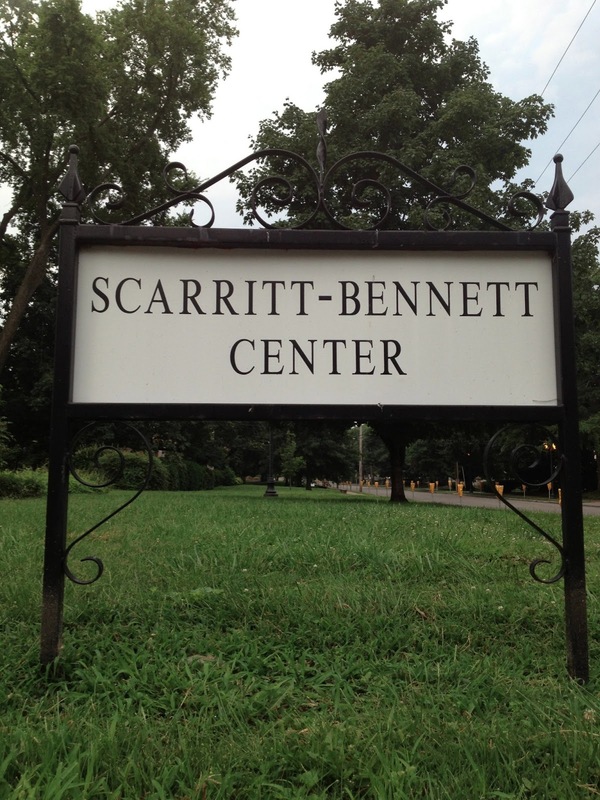 The Scarritt-Bennett center is a non-profit organization with a long and interesting story. It used to be a small Christian college. 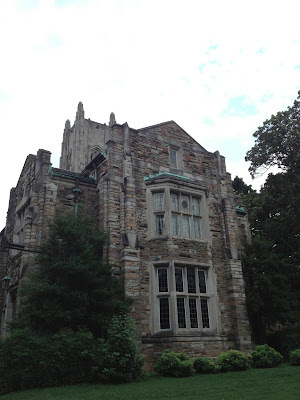 The old and fascinating buildings include small dorms, a dining hall, a meeting or central building, a chapel (many weddings take place here) and an auditorium. The grounds are beautiful. 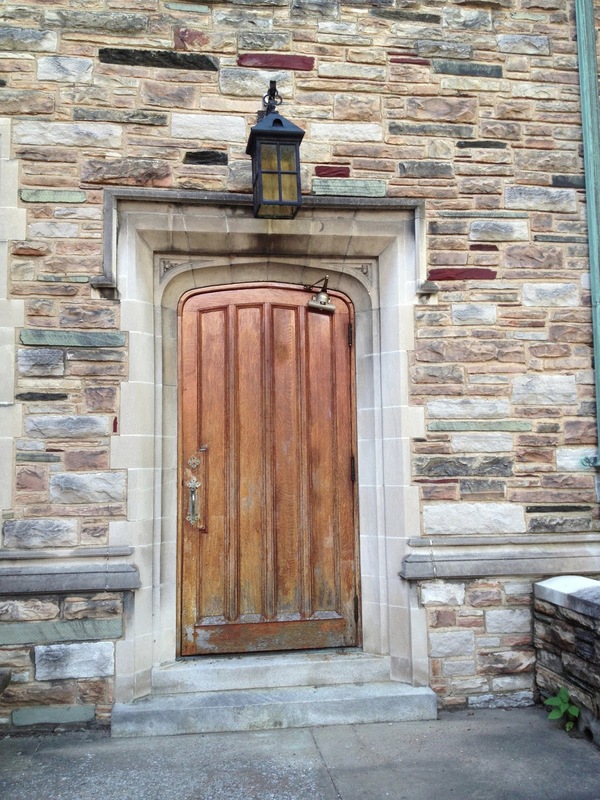 To read more about the history of the Scarritt-Bennett Center click here! I jump around a bit in order on this post but it is kind of how the photos were taken over the weekend. This is the building I stayed in, Gibson Hall. I enjoyed a second-floor small single room with its own bathroom. I felt lucky to have this luxury as most all of the rooms shared a bathroom in between two rooms. There was a reminder given at the start of the event to not lock your roommate out of the bathroom, which I thought was funny but also a very good tip for the weekend. Being locked out of your bathroom in the middle of the night would not be fun. The first night, Wednesday, I was taken out for dinner along with the other instructors for the event. This included Gale Zucker, Amy Christoffers and Jayce Boggs. Jayce Boggs is a spinning master and she has just started a magazine called, Ply. She was fun to talk to at dinner, very entertaining. She taught her classes and then left right after due to work obligations so I didn't see her much again after the first night. We got the first edition of Ply magazine in our goody bags. It's really good! 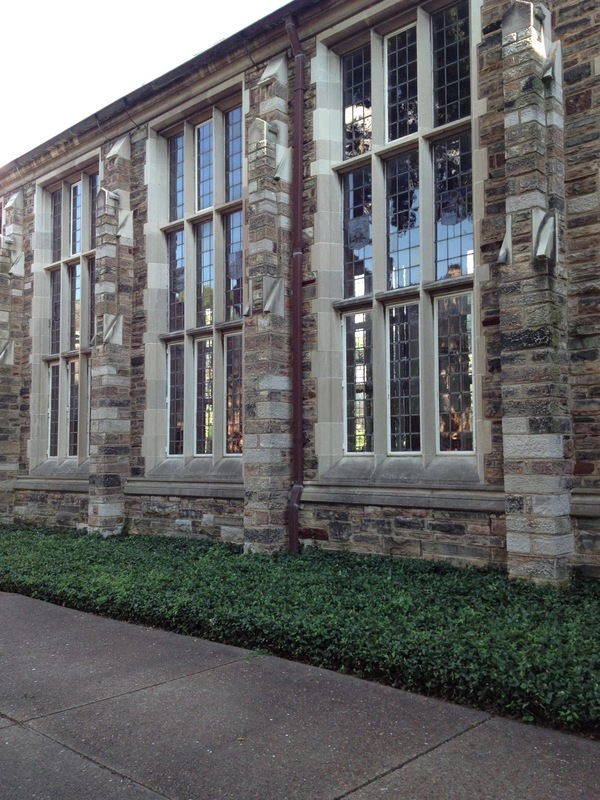 The stonework and detail of the buildings was stunning. I could look at these buildings forever and find new details. You just don't see new construction like this any longer. It is true artistry. 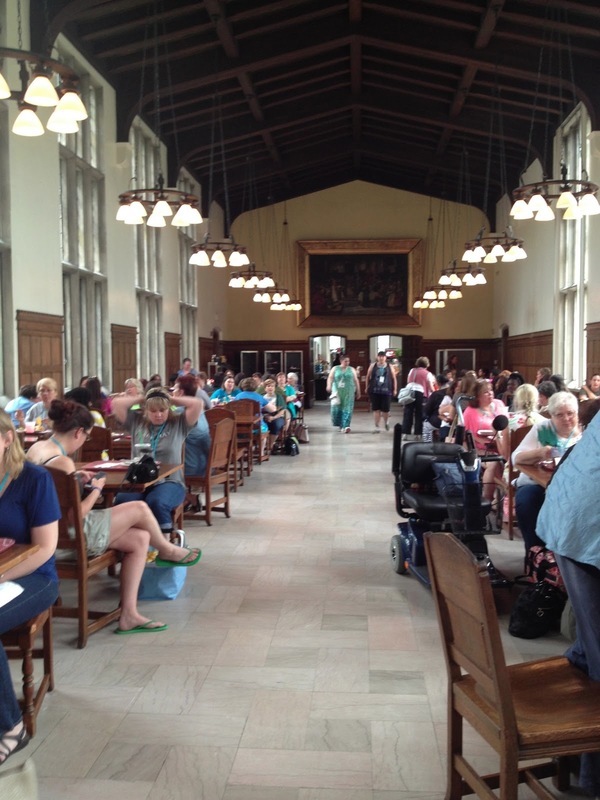 The dining hall was a gorgeous building with a massive door, huge floor to ceiling windows, a cathedral ceiling, and plenty of room for the 150 knitters. Above is the inside of the dining hall. People kept calling it the Harry Potter dining hall which I loved. The food for breakfast and lunch in the hall was surprisingly good and there were always lots of healthy options to choose from. I appreciated that. 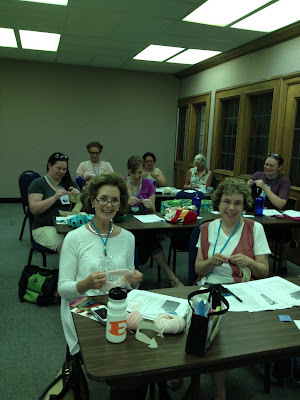 I felt like my classes were always packed full of fun knitters including a few celebrity sightings, in the knitting sort of way. Above in the front row I had Paula of The Knitting Pipeline on the right and the elegant Missy (marynvoigt - rav id) of Nashville, in the next row back on the far right with the sunglasses on her head is Laura of The Knitgirllls and hostess with the most-est, to the left in purple is madaboutmatisse (rav id) Denise of my Itty-Bitty Knits group on Ravelry (which recently reached over 4,000 members! 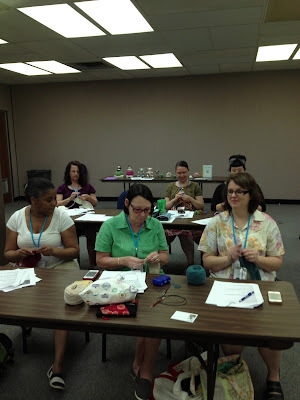 ), and then I had lots and lots of repeat class takers who I had previously met at other knitting events. That is always fun to see. I also had the pleasure of having Laura's mom, Nicki (not sure I am spelling that correctly), and her sister, Beck, in my baby cardigan class and Nicki again for my Fair-Isle hat class. What an incredibly hardworking, friendly, fun, kind, giving, smart family of fiber artists the Linnemans make. Rumor has it that Laura's dad was there but I didn't run into him. Paula generously let me tag along with her and her famous podcast sidekick Bronwyn for many a dinner. I so enjoyed that. What great company I was lucky to enjoy throughout the event. The woman in the second row on the right is slightly obscured but she is Rebecca Danger's best friend, Chris. Chris and Rebecca Danger came to the event just to have fun, Rebecca taught at the event last year and had such a good time that she came again as a knitter. That is a good sign and testament to how well this retreat is run. I love to see the students hard at work on the task at hand. I got to spend a little time with Rebecca Danger on Saturday which I loved. She is a kind soul and I am such a fan of her knitting. Click here for her Etsy Shop! Leslie, the other hostess with the most-est, made about 100 pom-poms to decorate the main meeting hall. It was adorable and worth the effort! It was hot in Nashville, as it should be in mid-July I guess. I dragged myself out of bed in the wee hours of the morning each day to get a run in before the temperature and humidity climbed. I ran all over the Vanderbilt campus and up and down the surrounding streets which were sprinkled with country music legend. 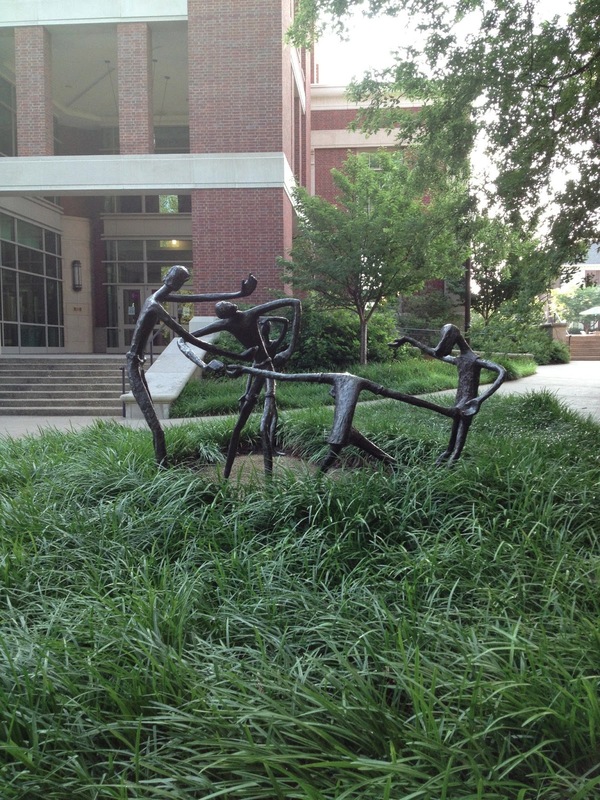 Vanderbilt has many "interesting" sculptures at every turn. I especially enjoyed this one. What does this say to you? It makes me feel like clearing my throat for some reason. 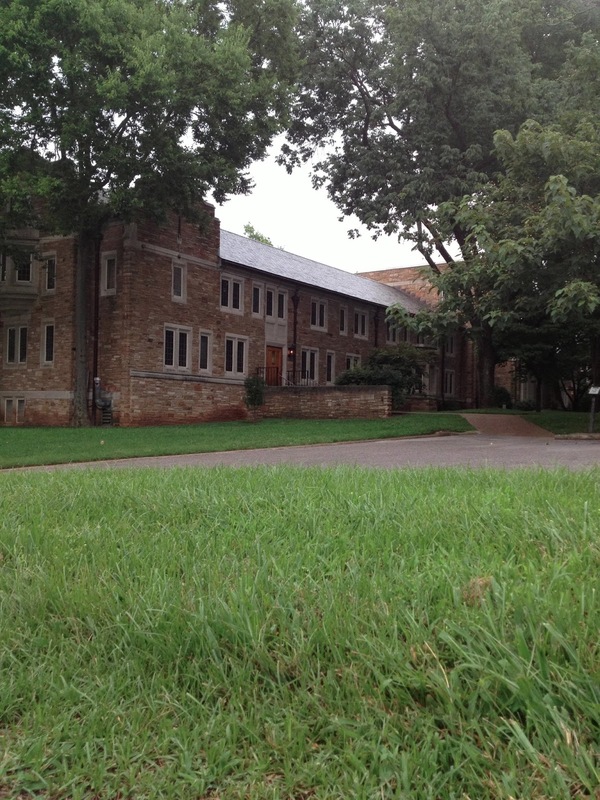 Here is the center of the Vanderbilt campus with buildings and the student union attached to the right and left of the grassy hill. I ran here a lot because there are paths that criss-cross up and down the hill. I didn't have to think about where I was going too much which is a good thing for someone directionally challenged like me. 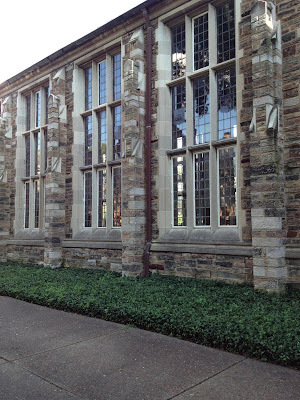 It is a pretty campus with loads of history. 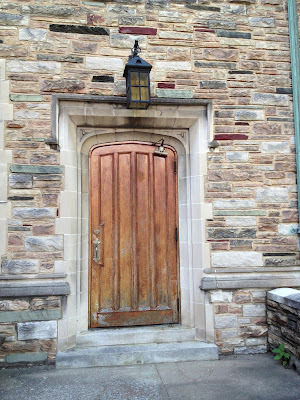 As I stayed in the Scarritt-Bennett Center I became very aware of doors and doorways. The doors all weighed about 100 pounds. They were solid and heavy and gigantic and forceful. To get to the different buildings you had to wind around paths and go under beautifully constructed stone archways which made it kind of magical. 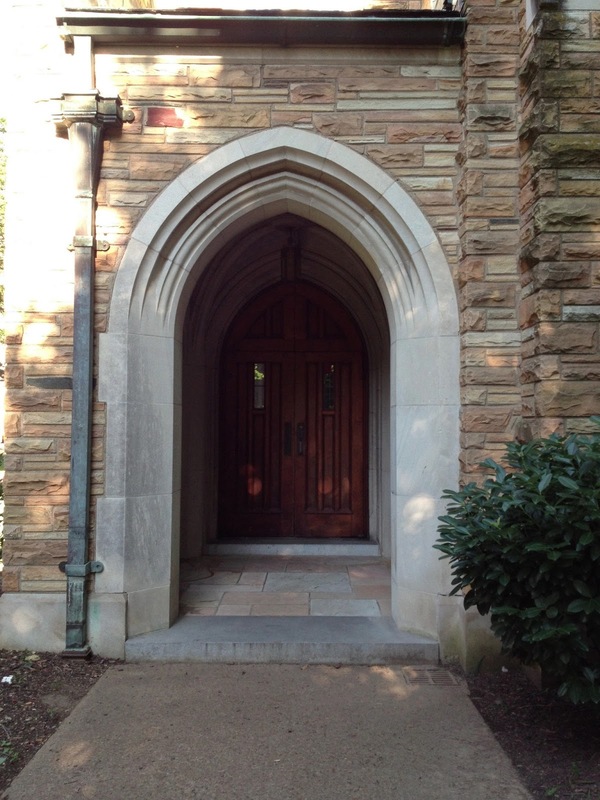 Below I took a few photos of the various doors and archways at Skarritt-Bennett. 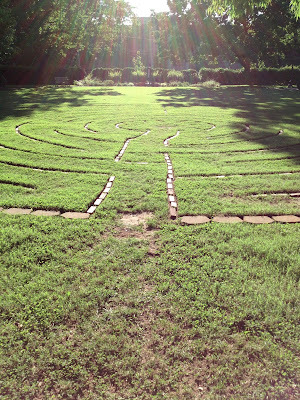 Right below my window was a labyrinth. I saw many a thoughtful knitter silently walking the labyrinth throughout the weekend. It was quite lovely. I even took a turn with Mel of Single-handed Knits by my side. Mel and I took a late night walk one night after dinner which was very fun and chatty. I enjoyed meeting Mel who flew in from Hawaii for the retreat. 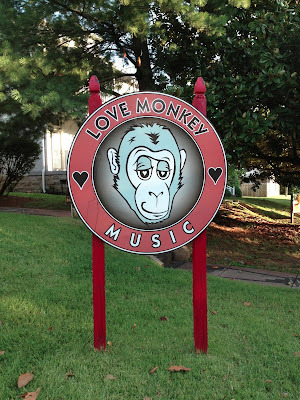 I ran up and down Music Row which is a street where about every old house lining the street is a recording studio. There were studio signs on the lawns and congratulation signs for various country artists and their hit singles. I got a kick out of it but to be honest my knowledge of country music is very limited. I knew a few of the names here and there. 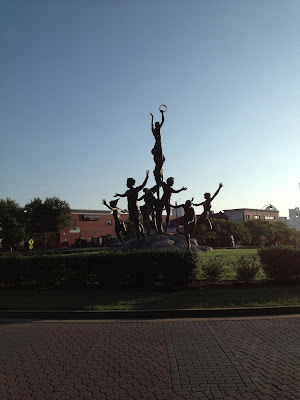 This sculpture has some deep meaning I am sure but it escapes me. 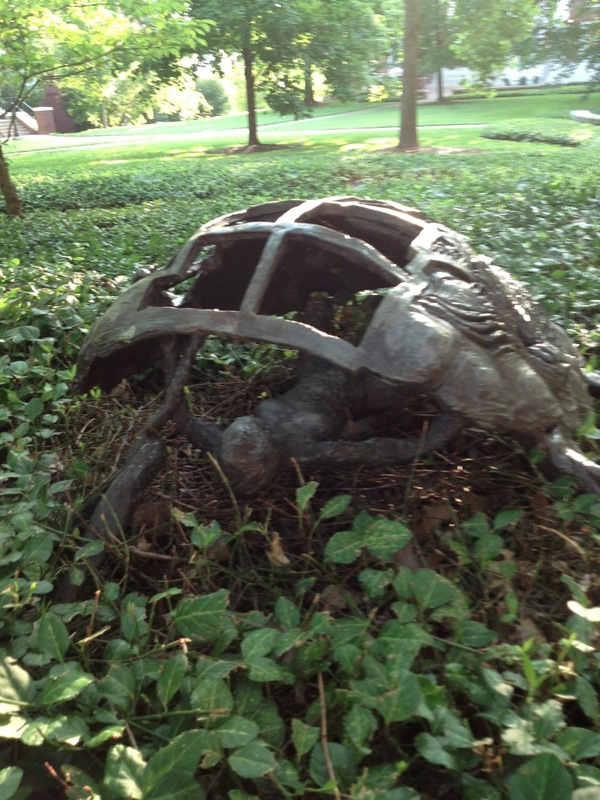 Under this turtle shell is a woman giving birth. Well, if you get it let me know. 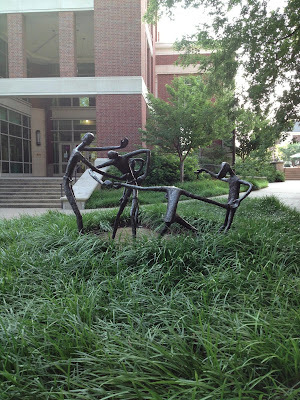 This sculpture is outside of the Vanderbilt Student Union building. I like this one. The movement of the people kind of pulls you in. 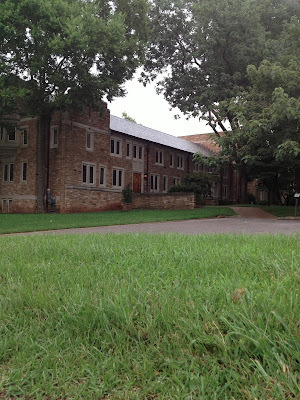 I also loved this thick tall grassy covering that was all over the campus. It makes you want to dive in and squish around. These two hardworking students stayed after class was over to make pom-poms with my Clover pom-pom makers for their Fair-Isle Hats. See them fluffing and trimming? Also, look at the hats sitting on the table (one is behind the cup). They both got so far in class, almost to the top of the hats, all while listening to me teach, coming up to the teacher table for demonstrations and while trying out new techniques. It was impressive. 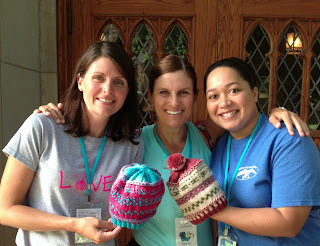 The next day in the morning they called me over to check out their finished hats! Look at the pride and the success in their faces. They learned two-handed colorwork, trapping or weaving in, corrugated rib, and left and right-leaning Latvian Braids, amongst other tips and tricks, all in three hours. The woman on the left is from Lake Geneva, Wisconsin. She was really disappointed that she didn't have her pom-pom on the top of the hat yet for the photo. That was cute. I had another woman from Delavan, WI, in my class. Wisconsin knitters are everywhere. By the way, behind the camera here is the one and only renowned photographer Gale Zucker. More on Gale in a second. There was the finely curated SSK market on Saturday. The doors opened at 10am and people were sitting in line waiting to be the first to get inside around 6am. The instructors got to come inside early to shop before the crowds. That's sweet Diane of The Knitabulls podcast leading the pack! Diane's husband is from Wisconsin and I love how fondly she feels about that fact. It was fun to meet her in person. She recently did a Susan B. Anderson Knitalong, which was quite successful, and she is making the Topsy-Turvy Petticoat Dolls from Topsy-Turvy Inside Out! I signed lots of books at the retreat. 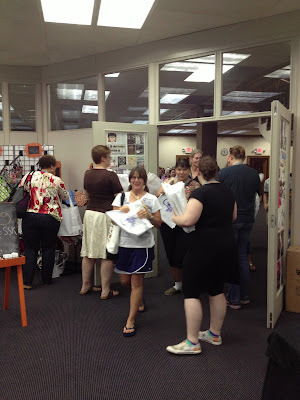 I had kind knitters stopping me throughout the days and before and after class to sign books. I always love that opportunity. It's very sweet. I had two people tell me that Itty-Bitty Hats is the first knitting book they ever bought and that they learned to knit with it. That's really the best. 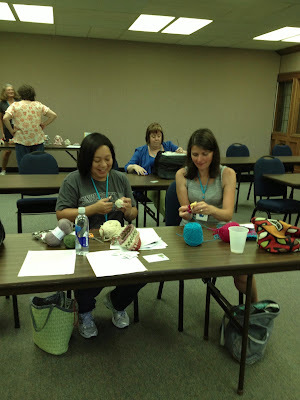 One of the best parts of the retreat is that I got to spend quality time with some of the knitters. Paula, of the Knitting Pipeline was one of those people, but in addition I got to meet and spend time with designer extraordinaire/teacher Amy Christoffers (that's pronounced like the name Christopher with an "s" at the end) and photographer extraordinaire/teacher Gale Zucker. Gale and Amy were on a mission to eat as many natural fruit and herb handmade popsicles as possible throughout the weekend. These creatively flavored popsicles called paletas were found at a place called Hot & Cold. I think they each ate about 6 paletas over a few days. I think the lime and mint paleta was perhaps their favorite. I tagged along one day and had a strawberry/blueberry paleta and it was delicious. Gale also had a chai tea mini paleta that was good. I think Amy had a hot chocolate and chilis paleta, too. 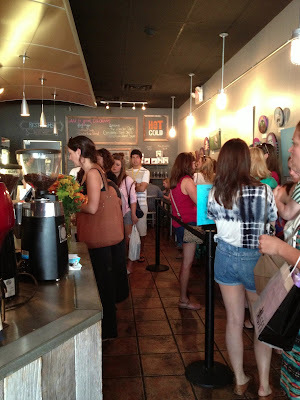 The photo above was taken in Hot & Cold and that's Amy (with the large brown bag) buying her second paleta of the day. These beloved and smart women were so inspiring to meet and get to know a little bit. I am hopeful our paths will cross again. Here is a quick photo of Paula and Mel before Mel had to leave. Now on Saturday night something really amazing and unexpected happened. While I was out walking around Nashville with Amy and Gale, Gale was trying to connect with Ann Shayne of Mason-Dixon Knitting fame. Gale happened to be the photographer for Mason-Dixon Knitting Outside the Lines so she knows Ann and Kay Gardiner well. When Ann called Gale back she invited us to her home for dinner! When Gale asked if I'd like to go to Ann's house for dinner I was so excited. Mason-Dixon Knitting (the blog) One of my forever favorites! Mason-Dixon Knitting Books - I own them both. 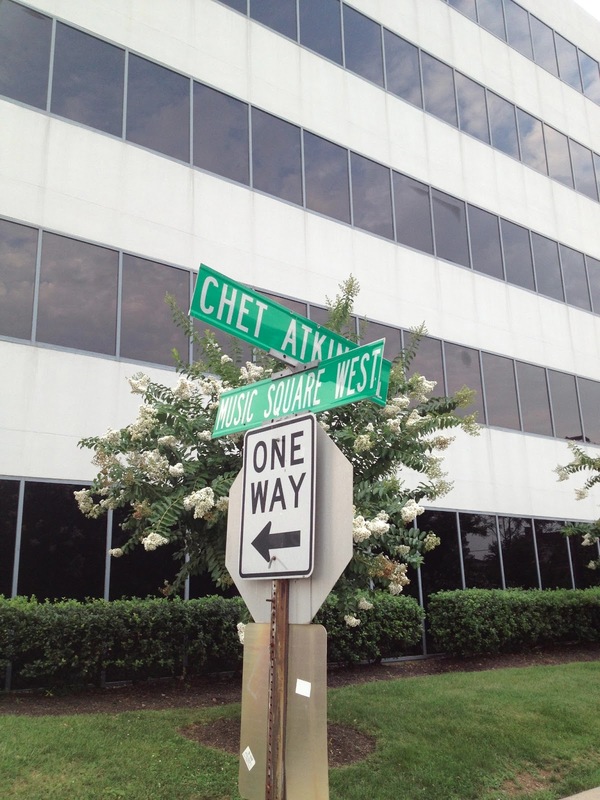 Ann Shayne's fiction novel, Bowling Ave. - set right in Nashville! I loved Paula's response when I told her I was going to Ann Shayne's house for dinner. I didn't want her to feel like I was ditching her and of course she handled it so graciously. She quickly said, "Go! I'd ditch you to go to Ann Shayne's house, too!" I loved that, so funny. Ann came and picked the three of us up at Scarritt-Bennett. We got a kick out of her bumper sticker saying to be sure and read Bowling Ave. (her novel). She agreed to sit by her bumper sticker for a photo. Just look at Ann Shayne, there is really something about her. She is so easy, casual, friendly, warm, pulled together.... southern in the most lovely way possible. As Ann drove us to her house she pointed things of interest out along the way. One of those sites was the home of Big Kenny. I had no idea who Big Kenny was but Ann filled us in by saying Big & Rich, the country duo. As I said, I don't know beans about country music but I do know a few names and I have heard of Big & Rich for some reason. Big Kenny has an enormous gated mansion set right in a Nashville neighborhood with a built-on studio and many, many cars in the huge driveway. Ann also pointed out Taylor Swift's penthouse apartment which was fun to see. Fancy stuff, people. Back to Ann's house, what a gorgeous, beautiful, warm home she has made for her family. We sat out on her large screened in porch for dinner and knitting. The temperature had cooled off quite a bit and it was very pleasant. There was also a wonderful thunderstorm that passed through and it was like heaven sitting on that porch knitting and chatting away with these extraordinary women. Being outside felt so good after teaching inside most of the time. Ann Shayne has wonderful artwork and textiles decorating her house. Her kitchen is adorable and fun. The powder room even has handknit hand-towels. Yes, there was a stack of neatly folded handknit towels next to the sink. Whatever fantastic ideas you have about Ann Shayne - it's all true. She is funny and smart and talented. Her home is even better. 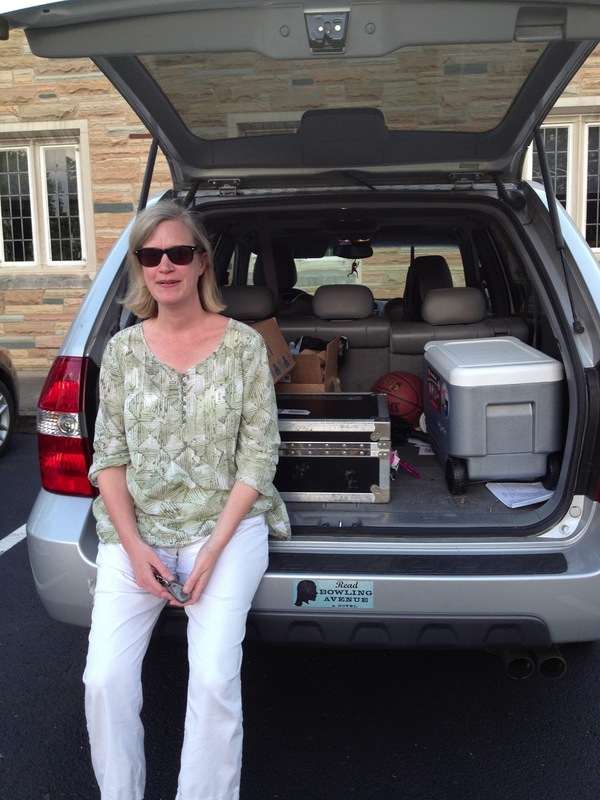 Her son had his wisdom teeth out that day so Ann's husband was being the caretaker for him while Ann was with us. He would sweetly call her away now and again to help with her son. What I loved about Ann's conversation-style is how she would insert the funny and quiet quip every once in awhile. If you are able to catch these funny bits you will be laughing out loud. She is hilariously funny but in a quiet way, which to me is the best. She told one story about her son's tooth pulling adventure that literally made my sides hurt from laughing. The. Best. 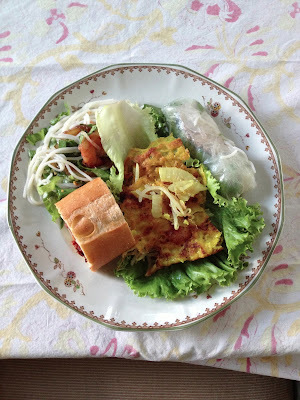 Ann had ordered in Vietnamese food for dinner and it was fresh and delicious. I helped Ann spread out a lovely printed table cloth, then she effortlessly pulled out these sweet plates for our dinner. She had a pitcher of ice water for us to quench our thirst. It was all relaxing and really lovely. Sometimes I can't believe my good fortune and this night easily falls into that category. What an amazing way to end our time in Nashville. Ann took a photo of us on the porch with our knitting to send to Kay so she would be jealous. Kay wrote back, "Jealous." How good is that? As we were chatting Ann told us that she had recently seen a baby barn owl in her back yard, in fact, two of them. As the sun was setting there was a rustle of leaves and a large bird flew by the porch and landed in a tree. The evening included a baby owl sighting. It sat for a long time and unfortunately I only had my phone camera with me but you can still see the owl on the branch. It was pretty cool. We stayed on Ann's porch until well after dark knitting and chatting away. I didn't want it to end but we finally had to give into the fact that we were all tired. She drove us back to our dorms. We said our goodbyes, I packed up for an early morning 6am pick up and SSK ended. Every year Laura and Leslie are asking new and different teachers to their event so I don't know if I'll ever be back again at SSK. I have definitely offered to come back and teach any time in the future. SSK goes down in my books as one of the great memories in my knitting career. Thank you to Laura and Leslie and the knitters in my classes and the knitters at the event. 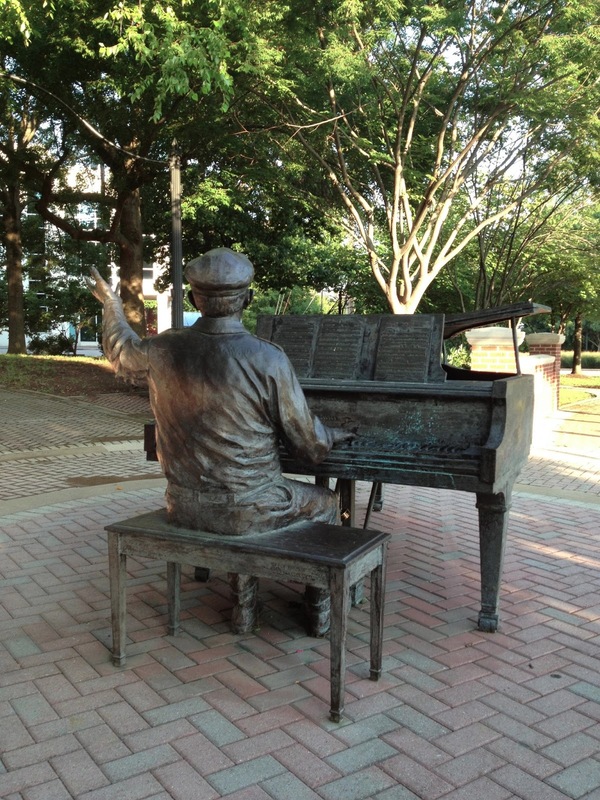 I am so very happy that you had a good time in Nashville. I loved all the anecdotes and photos. We travel to Nashville often but you highlighted areas unfamiliar to me. I can't wait to visit some of those spots. Thank you for making me feel like I got to be at SSK too. I'm sure it took a long time to put together this post and that is much appreciated! PS correct, 6 paletas in 4 days. Going through withdrawal! I love your arch photos! I wish there was more time, I would have loved to take your fair isle class-I heard wonderful things from those who did take it-and to chat with you. Oh Aimee! I feel the same way. I was thrilled to just get to say hello to you! I love your podcast, Knitting in Circles. Your photos capture it all! And reading your story was such a great way to ease back in to life after SSK. I am so thankful I was able to take both your classes. I knit on both the baby sweater and color work hat! I can not thank you enough for giving me such a sense of empowerment. Epic post! 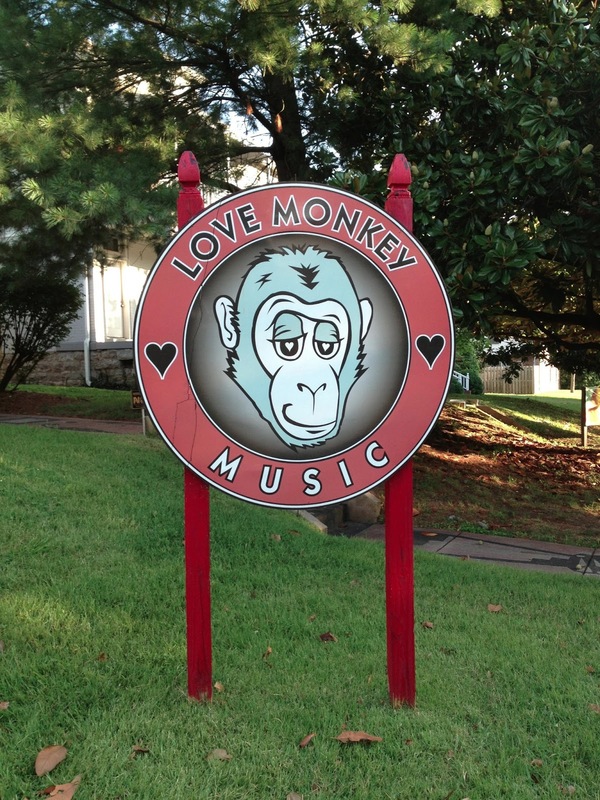 SSK sounds like so much fun - and Nashville isn't that far from me! Maybe next year ... I'm so glad you had a good time! For those of us who can't get to one of these wonderful excursions, reading your posts are the next best thing!!! Many thanks. 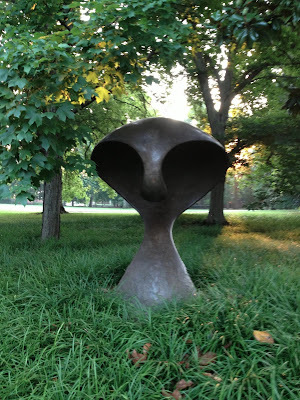 Thank you for such an informative and thoughtful blog post on SSK. I want to go! It was so wonderful to see SSK through your eyes. I love the way you write, oh woman of so many talents! The photos are great and I laughed at the comment about the turtle sculpture. Thank you for making my already perfect Saturday morning even better. It sounds like a perfect holiday! Your wonderful post made me feel like I was there. I love the wonderful feeling your words bring forth. Fingers crossed that KnitEast will be just as magical! Loved this post. How can I find out about attending SSK? Thank you, Susan, for this amazing recap! As a knitter who enjoys all of these podcasts and podcasters I truly appreciate your pictures and perspective on this event I can only hope to attend! I feel as though I was there, even in some of the classes. WOW to those students who were able to finish class projects. And your running photos of the area was especially appreciated.,.maybe I can run with you in 2014! Thanks again. Enjoyed the pictures of the SSK tremendously.... Wonder where you found the penquin pattern you had featured in the Instagram! It was sooo cute! Yeay! I loved SSK this year, too. It's always amazing. I didn't realize you'd snapped a photo with me in it until I read this post - that's me in the green flip flops in the lunch hall. I wish I'd had more time so I could have taken a class with you, but perhaps you will come back to SSK in coming years and I'll have that chance. Susan - thank you so much for your great blogpost about SSK. I love to be a vicarious participant. Your photos and commentary are excellent. I wish there were such gathering in my country too ... :( It sounds alot of fun, relaxationg and..knitting.